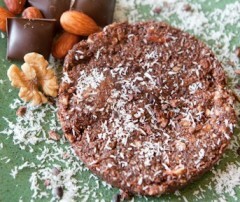 These yummy cookies are topped with shredded coconut and cocoa nibs. Cookies are dehydrated at 105 degrees. Learn more about Sunna’s Cookies on her website. This cookie make a deliciously different tea time treat. Since this is a locally made treat, I decided to go for a locally acquired tea, so I brewed a cup of Buddha’s Delight from Mint Tea to enjoy with this, and it was a delightful moment of tea and cookie. The warm spices of the tea paired nicely with the sweet coconut and dates. So many things about this cookie make me happy. I am happy that it is a handcrafted, local food item (it was in my Portland Tasting Box, so it better be local, right?) and I am happy that Sunna’s Cookies is a company that sells its wares on Etsy. I love that Foodzie is helping Etsy sellers gain some exposure. I’m happy that this is a raw and vegan food, although I’m not exactly sure why, because I’m neither vegan nor a raw-food foodie. I think that it just makes me feel good to know that this is might be healthy, or at least, it seems like it might be given that it is a raw, vegan food item. Those terms make me think “health food.” But mostly, what makes me happy about this cookie is that it is chocolate! YUM! This is really good. I love the texture, it’s a bit like eating raw cookie dough – it’s soft and moist and chewy. And really, who doesn’t love raw cookie dough? The chocolate is rich and the coconut adds sweetness and it’s own, distinctive flavor. I can taste the dates in there, and the walnuts give it a moment of crunch every once in a while. It doesn’t taste exactly like cookie dough, because, well, the pastry dough part of it is not there. Instead this is a bit more like one of those health food power bars, only I am enjoying it much more than I do most of those commercially made bars you can find at most grocery stores. It tastes delicious, and it is really satisfying. I felt hungry before I tore into this cookie, and now, I feel satiated. When I first received this cookie, even though it is chocolate (and coconut!) and even though it’s a locally handcrafted food, I wasn’t too sure about the vegan and raw part, mostly because I don’t think I’ve ever had a “raw” cookie except for raw cookie dough and this didn’t seem like it was going to be that. But one bite had me convinced. I really like these … I’ll have to get these again and maybe try the other flavors!